Love your little puppies...so beautiful. I have a hard time beading with a long hair dachsund wanting all my attention too...just love them though. your beadwork is beautiful. Thanks so much, Jacquie! I bet your fur baby is gorgeous, too! LOVE the puppies! 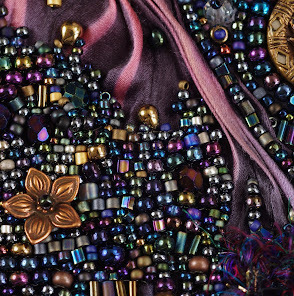 Oh that orchid bead is fabulous! I know you are going to do something wonderful with it! I love the pictures of your dogs! It's so funny how they all have their own personalities. I have two dachshunds that I adore. 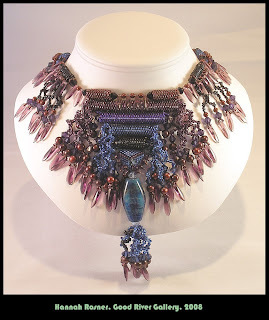 The orchid bead is perfect and the Toas Sunset necklace is spectacular. Hannah makes incredible beads, doesn't she, Patricia??! I had a hard time choosing, that's for sure! Mary - dogs are just wonderful all the way around! I am sure you have a great time with your two as well, it is impossible not to love them! So THAT's where that orchid went. I tried to buy it last week. LOL! Congrats on a lovely purchase. Off to check your feature on Mortira's blog! Your pets are beautiful all are unique in there known way.I like the teddy.Best wishes. Oh, those puppies, how sweet are they? The vessels are just gorgeous. I want to squish my face right up in Sunny's!! LOL!!! K, if you think beading with a Pom on your lap is hard, you should try it with a 9 month old kitten.... Now THERE'S a sport that should be in the olympics! 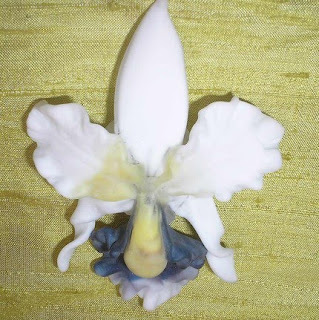 Oooh, can't wait to see what you make with that orchid. Oddly enough, orchids were my photography subject last Monday. They're such gorgeous flowers, aren't they? Saludos, antes que yo diga otra cosa, sus trabajos, que MARAVILLAAAA, y la otra cosa: sus perros me encantan, le envio mis abrazos y besitos!